I absolutely love sewing with scraps! 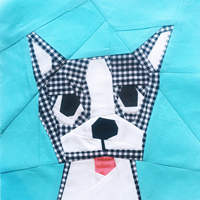 So I am happy to be participating in Kim's blog hop for her book Scrap Happy Sewing. This book has 18 fantastic projects, and it was pretty easy to pick a project since I've been doing a bit more hand sewing lately. I needed a new needlebook , because we all need a needlebook in every single project pouch we have, right?! This little guy was a snap to put together thanks to the clear and easy to follow instructions Kim gives. I took a few minor liberties with the pattern, but kept it the same as the instructions for the most part. This is a book worth having! And now for the exciting news! F&W has graciously offered to give away one eBook copy of Scrap Happy Sewing to one of you! Just leave a comment on this post and you'll be entered! I'll choose a winner on Monday April 20. Also, F&W is giving away a hard copy of the book and some fabric, so you might want to click over and enter here! Scraps are good to have, to hold, to stash and then to use!!! Trying to organize and use more of my scraps... this book would probably be helpful! I love scrappy projects too! I just love digging into my scrap bins, it brings back happy fabric memories. I am dying over the adorable needlebooks and pincushions on this tour- I want a whole pile of them now! Thanks for the chance to win- this book looks so fun! Great to have book that will give me ideals on using scrapes. You can't have enough scrap projects that are as cute as that! So cute! Thanks for the inspiration. In awe of your neat binding - mine always goes askew! The projects in that book look like so much fun to make. I bet even if I made every single one of them, it would not make a dent in my scrap pile. The book looks great. Thanks for the chance to win a copy. Looks like a lovely book! I have been sewing for years and have not made a needle book yet. It's about time. Thanks for sharing. It looks like there are lovely projects in this book! Thank you for the giveaway! Love me some scraps ! Beautiful way to use scraps! This needlebook is so pretty I would want one in every project pouch too! Love the combination of fabrics you've used. Great use of scraps. I personally think scraps multiply on their own. I would love to win this and make create some of the ideas. The sewing kit is really useful!!! I really like the pouch and being a new quilter I have lots of scraps. This is a great subject for a book. My fabric stash contains many years worth of offcuts from the shortening of clothes, as I come from a long line of shorties. I need more ideas of what to do with them. I love scrap projects! Would love to win! Love your needle book and all the Happy Prints. I'm always hunting for a needle and thread. And a small pair of scissors. Maybe if I made this in HOT PINK I could find it! The book looks great. Your needle keeper is adorable too! 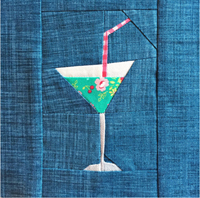 I love sewing with scraps too!! I love using scraps and I tend to keep even teh smallllllest ones!!! I love new ideas for scrappy projects! Scraps at the ready and I've got plenty! Lovely things to make. Thank you for the giveaway. I hope to start a scrappy quilt sometime soon, but I am sure I will have enough "little bits" of scraps left that I could make every pattern in the book, lol. Thanks for the chance to win! Your needlebook is sew sweet and I love your threadwinder. Just what a scrap collector like me needs - please. Love the little needlebook. I'd love to enter the draw for a copy of the e-book please. I've got plenty of scraps, so I would love to win this book. I'd love some ideas for using up my fat quarters! I love the needle book and have signed up for 2 swaps. This book would be perfect for me!! Thank you for sharing. Such a great book! I love using up my scraps that I just can't stand to toss! I have a ton of scraps waiting for this book of projects and would love to win! I am impressed with your binding and perfect it is! Thanks for the chance to win. I love the pincoushions in this book! They are so cute!